What a wonderful thought Fr. Stephen. If only we could see ourselves in the eyes of our God and Heavenly Father! I know our perception of what we look like and who we are would be greatly altered. As my body ages, and so many things change about my physical appearance, I have this vision of myself as still the five year old girl I was when I first accepted Jesus as my savior. I think that is who God sees. The kids that is still inside me, and surfaces so often, especially in our wonderful church. I am struck with awe, at being where the faces of Jesus, Mary, and all the Saints are present. It is like being in a corner of Heaven itself, and coming to visit our heavenly parents and family. My husband used to joke he was married to the oldest five year old he knew! In a very kind way. But thru the rough things life has thrown at me, with God’s help, I still have that sense of wonder and deep love that knowing God is with me can give. We are God’s children, in every sense, and we are beloved and treasured by Him. I know that turning away from Him seems to be the trend with so many – like you said – seeking to “find ourselves”, and working on ourselves. I love that you say we need to turn outward and learn who we truly are to others, and to God. I see too many parents into their electronics; their jobs; and their own “selves” to be raising the children they have. Their children need guidance, help, and the supervision and engagement of their parents in their lives. I worry at what this is doing to the children. Looking outward and communicating with others is a goal I am going to undertake more seriousy now. I mean, in person, actively listening and engaging people in real conversation, not just texting, or social media. We humans need the human connection, and I think we have let electronic media take over too much in that respect. Your post is very timely, and I am going to make it a point to stop so much electronic communication and call or visit. It is interesting that the first thing a healthy baby will do is to look you in the eyes. This is quite natural, that the baby wants to look at mom or dad face-to-face. She gains comfort as we look her in the eyes and smile. She smiles back. The baby begins to know who she is with these face-to-face encounters. And we, as you note, only truly get to know God in these moments of face-to-face encounter, in the heart. A blind person can “see” the other with his hands. And he can behold God in the heart, face-to-face with no need of physical sight. As Jesus said, it is those who refuse to see who are truly blind. How should one balance between one and the many while thinking this way? I agree that we are to live for the other, however, aren’t we to still maintain “self-differentiation” so that the other can still see us as a strong individual they can confide in? I don’t want to completely lose my boundaries while seeing myself in the other. Maybe I’m misunderstanding what was said above in relation to this question/thought through. I’ve been trying to find out the proper balance between the one and the many as I’ve been developing boundaries and doing some introspection into who I am in Christ. The Iconicity of the Incarnation is what struck me quickly here. And the presence of the Icons in our own Parish. Thanks for this, Father. Adam, we should always have boundaries; they are healthy and provide proper safety. But our existence is not defined by looking within those boundaries; rather we are brought to ourselves by (safely) engaging others (the Other) outside of them. To use your example, the ability to confide in another is not necessarily enhanced by their perceived strength but by their love for the other. Trust in love, as opposed to perceived strength, forms that communion. Just my thoughts. It’s a very good question. Boundaries are essential in what it means to be a person. The Father is not the Son, etc. It is, I think, the danger in human relationships – in that we are sinners. When we engage each other in a way that ignores the proper boundaries, we are failing to love. We are using the other, owning the other, exploiting the other, etc. But, we cannot be who we are without the other. I cannot create myself within my own defined boundaries simply because that is not a true existence. First, God alone will give us true and proper boundaries – because He alone loves us rightly. That is the deep sadness of false teachings regarding God. “God” becomes a tool for others to abuse us and ignore proper boundaries. So, we seek healthy relationships, places where we can know others rightly and be known – and where we can know God face-to-face. It’s not easy. You often emphasize the non-legal nature of sin. And again, in this article define sin in terms of turning our faces away from the face of God, moving in the direction of non-existance etc. How then would you view God’s forgiveness in a non-legal way? If sin is not a legal problem, but a movement toward non-existance, what does God’s foregiveness entail, and how does it interact with our repentance, our movement back towards Him, our ability to see His face and not perish? That makes sense to me. As someone who is trying to develop good boundaries, do you have any advice in that area for someone who struggles with people-pleasing and anxiety? I greeted two friends at the door this week and they commented how much they liked being welcomed by me. It struck me that I have no sense of what it is to be greeted by my face at the door which is blessedly out of ego control. So, what you say makes so much sense. In the day of the Selfie, we are constantly bombarded with distorted views. Thank you for your deep thinking as always. Also, appreciated this reply of yours: “So, we seek healthy relationships, places where we can know others rightly and be known – and where we can know God face-to-face. It’s not easy.” Amen. This is a subject that the much-loved Elder Aimilianos often spoke of with perspicacity. Anxiety and people-pleasing rarely don’t go hand in hand. Though they’re preferable to haughty indifference [in fact, anxiety and people-pleasing are often a sign of an especially strong, underlying yearning for authentic love and humility –that is, however, “malfunctioning”], a behaviour that might be interpreted as ‘indifferent’ [though not the haughty kind of ‘indifference’ but the ‘indifference’ that is actually a mindful, watchful ‘distancing’], is, in fact, the virtue par-excelence needed to counter anxiety and people-pleasing. Practically, this good ‘indifference’ might be manifested as a mere self-censoring of our frequent tendency to confess our problems and opinions and questions to others (an expression of our ego at best, or sometimes a veiled technique to control or bait others with ‘love’, or simply a proof of our apathy for God – manifested as a turning towards all others). Our self-censoring silence takes on a very deep quality when it is practiced for this reason however. It must also be accompanied by an internal silence and indifference -as far as we can – to everything that isn’t God. This can even bring self-respect and the respect of others – as a composed disposition commonly does – yet without losing our repentant humility in our continued internal ‘Godwards turning’. The key is that our motives are nothing other than “to be with Christ” in the sacred place of the internal heart, to confess to Him alone (and His appointed confessor alone) and not to men and women, to trust Him and not men, to give our entire heart to Him and not to so many others: our authentic oneness with others can only come through union with Him and His own oneness with them. In short, it is the restoration of right-being, a re-setting on the right path, a healing from the damage done to the soul by sin. In some small measure, it extends towards the one we have hurt and injured (if that is the nature of the sin), but only in a limited way. Those relationships are two-way and require that forgiveness and acceptance be extended towards us. I’ll use an extreme example: murder. The one who commits murder can certainly be forgiven by God – though this is a very deep work, and, rightly can take years in being fulfilled. But, the one who is killed is still dead. You cannot give life back to them. God can, though, obviously, not here. Such an action (murder), “binds” us to the other after a fashion. They’re being put right is partially dependent on us – or can certainly be aided by us. And so we pray. We fast. We make reparations in whatever manner is possible. We do not simply wash our hands of such a thing. Forgiveness is a new life – and that new life should be life-giving to all around us, including those we have harmed. That’s an extreme example. But, it remains true to lesser degrees no matter what we are discussing. There are “sins against the self” – as well. And our repentance is directed towards the process of healing the damage done there as well. I hope those thoughts are of use. That was immensely helpful and a lot to ponder. What text/reading of Elder Aimilianos did you learn this rich information from? I would love to check it out even more in depth. Something that came to my mind after these comments (esp. Dino’s) is interaction with monks. They are cautious, rightly, about excessive speech, distraction, etc. 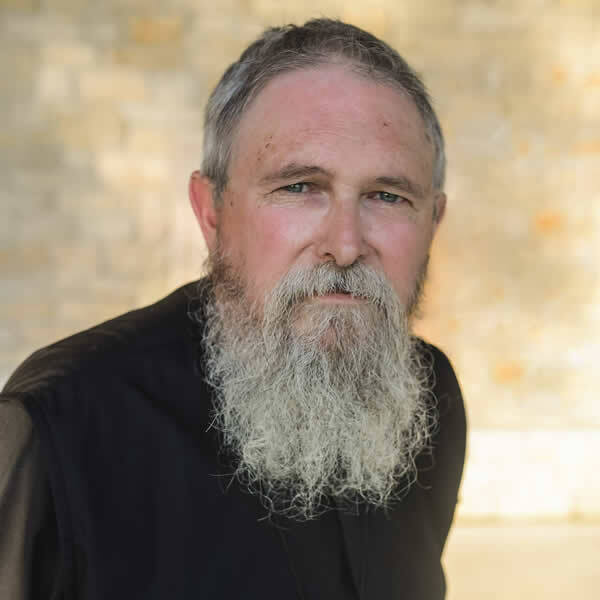 Our parish is blessed with a lovely community of monks who radiate Christ from their faces. I have with them much the same relationship I have with my patron St Mark, I know the face, and in it I see Christ’s love, though I’ve never had a conversation. And I must trust that this is for the best for all involved. A time to speak, and a time to keep silence, but at all times to persevere as seeing the unseen. Thank you, Father, for pointing towards the face of Christ. I am sorry that I cannot really help with such specifics… I haven’t a precise text of his in mind so much: these concepts creep up in the majority of his homilies with varying barefacedness. One book that has slightly more than others is the one with the Elder’s homilies on St Isaiah the Solitary (though I am not sure if there’s an English version of this one just yet). A homily that does come to mind (but is clearly of no help to you) is one he made on the Lenten prayer of St Ephraim (of no help because it is still not in print – it exists as a recording in the Simonoptera Monastery). Because it was strikingly insightful I have kept notes from it that I return to again and again, for decades now. Ah, I see. Well, I thank you for your insight nevertheless. I look forward to the translations of the homilies whenever they happen to get taken up. Have you read all of his books? – If so, which one of his books do you recommend to start with? Here are all the translations and commentaries by Fr. Maximos Constas, we owe him a huge debt of gratitude for his work. I had a chance to thank him personally at a retreat last Lent. It was such a blessing to meet him. Thank you Dino. Your comment touched my heart on a very personal level. Your wisdom in dealing with others is welcomed. I was recently in a place to advise a friend about a person to be very wary of. They had made her very uncomfortable, and I knew that person could be potentially a threat to her. Advising her without letting my own personal worries about that person take me further than I should – was a challenge. The person was my ex husband, and he had turned to wrong, and far from God long ago . I knew the level of danger he was capable of being to her, so knowing how much to say, and what not to say , was hard. I see the wisdom you shared about not trying to persuade people with help too. Allowing my knowledge of that person to color too much my advice to her about stopping unwanted attention from him. It is easy to cross that line. Thank you for reminding me. I would assume that in English one needs to start with the first publications “The Authentic Seal” and “The Way of the Spirit” which are collections of independant talks. Rare gems worth studying. Here are some of the translations and commentaries by Fr. Maximos Constas, we owe him a huge debt of gratitude for his work. I had a chance to thank him personally at a retreat last Lent. It was such a blessing to meet him. For those who read French, look for Eleder’s books at “monastere-transfiguration.fr”. Thanks so much for this resource! I’ll be reading all of these soon. I see these two books exist in French: “La voie royale. Saint Nil de Calabre” and “Discours ascétiques. Commentaire d’Abba Isaïe” (the one mentioned earlier). Or, maybe its the myth of Narcissus and his iphone. I have been rather fixed on Ps 26 of late. Wednesday night I was reflecting with the youth on it and we talked a little about v. 8, “My face hath sought after Thee; Thy face, O Lord, will I seek.” It didn’t occur to any of us that “face” is something that is for The Other. I will file this post away for sharing later. Being seen can be a deeply and hurtfully shaming experience, unless there is love in the beholder.. The practice of selfies seems strange but I see it almost all the time. And I presume there is a desire for being loved in the practice, but it also seems to serve as a practice to objectify ourselves to ourselves. I’m particularly am grateful for this article. It had come in a time when I needed to read it. The part in the article where it describes how, as we reference “I am” we also invoke God who gives us being, is an unexpected revelation. I don’t want to hijack this idea of faces, but I started thinking about other ways we know who we are. So I want to consider hearing, and the effect on us of hearing ourselves say our prayers aloud. I heard recently that the ancient practice of reading was to read aloud. My prayer time as a Protestant consisted of silent prayers. As an Orthodox, I have been trying to speak them aloud. It’s an effort, a sacrifice. And I wonder what extra benefit there is in the physical production of sound waves, and in their reception by the hearing organs? We also know ourselves by our voice. I don’t want to hijack either but I wanted to interact with your ideas. Long before I was remotely considering becoming orthodox my sister and I decided that whenever we had to read something for our high school literature class that would have historically been recited , we would read it aloud. We ended up reading the Iliad, the Odyssey, the Aeneid, Paradise Lost, a bunch of Shakespeare etc… We could tell what a difference this made in our comprehension and grasp of a work, but it NEVER occurred to me to do the same thing with scripture and prayer. Not even with the psalms. Even though I had been a good Protestant who had read her Bible through many times, I was shocked at how little I knew the Psalms when I started chanting through the Psalter. There is something about reading aloud/chanting that seems to get the words much deeper into our hearts and minds. My newly-illumined daughter (age 18) who is on the autism spectrum has been reading Psalms (and other Scriptures) and her Orthodox Teen prayer book out loud regularly every day ever since her baptism August 5. Reading out loud is especially important for her comprehension and processing. “There were no mirrors in my Nana’s house. And the beauty that I saw in everything was in her eyes. I never knew there were things that I’d missed. ‘Cause the beauty in everything was in her eyes. I don’t own a cell phone myself, but I think the phenomena of photographing everything and posting it on social media sites like instagram goes hand-in-hand with the current trend of “mindfulness” taught by Zen Buddhism and modern gurus like Eckhart Tolle. At its heart is a longing for Reality. That is an important thought. In our fallen state, humanity can experience the Present only fleetingly. Our lives are shaped in the present moment–but as soon as we are aware of the moment it is already past. Thus, the vast majority of what we call our lives is actually the memory of interacting with the Present. “But they have been dead many years,” replied the doctor. “It was Tertullian who first gave the formula for expressing the Christian idea of God: “una substantia-tres personae”, one being in three persons. It was here that the word “person” entered intellectual history for the first time with its full weight.” (Cardinal Joseph Ratzinger in “Concerning the Notion of Person in Theology”–this article can be read online and goes hand-in-hand with what Fr. Stephen has written in this post but in more detail). Today, the Christian concept of person-as-relation-to others has been utterly distorted and re-defined. As Father Stephen said, the concept of “person” is now synonymous with autonomy and dependent on nothing but itself for its definition. Sadly, the “selfie” misses Reality entirely and is but a denial of what we really are: persons disclosed in the word of Jesus the Christ and ordered for eternal life. “If you read French….” Oh, that our American language courses were a good as the European system to give us real access to other languages! After six years of studying French, I don’t think I could get much from such deep books. I wish I could read them. I am a blessed man. My wife loves me. When I look into her face I see that love and the love she shares with our Lord. My soul is revealed to me which is why sometimes it is difficult to meet here gaze. When I am able, there is nothing but goodness. There was a BBC special (I believe in the 70s or 80s) on The Face that explored it’s impact concerning communication with others and in society. It was fascinating but I cannot locate it now. If I find it, I will post it. I also heard recently that in ancient times all reading (and praying) was done aloud. There was no such thing as reading “in your head”. So all the reading in the synagogues was also out loud. I think this was linked to the fact that initially the Grace was evident in the first Christians through the speaking-in-tongues. Only later the Holy Spirit instructed the Christians to pray inside the heart (this was an explanation why the speaking in tongues slowly disappeared, and was replaced by the hesychastic tradition). “Being seen can be a deeply and hurtfully shaming experience, unless there is love in the beholder”. I once shared an experience about participating in a workshop (we looked at each other “from the head” and “from the heart”). The difference with these two approaches was amazing. I was very interested in trying it, since it was not unlike what Father Meletios Webber suggested in his talks I attended at that time in my life. Thank you Agata, for the link and your description in that comment stream. It corroborated my experience as well. I’m in an environment that judges— perhaps we all are. Since I have always been judged, you’d think I would be used to it by now. But that kind of gaze hurts. It helps to remember Christ in these circumstances and to somehow move toward such pain than to recoil from it. To do the latter would only be possible with the humility of Christ in me. But my own tendency is to want to hide. I’m not surprised to hear of an exercise that involves eye-to-eye contact – the experience is profound. It is also a slightly “dangerous” exercise (not damaging, but emotionally stressful). We turn our eyes away in shame events precisely because it offers a form of emotional protection. Only in a very safe, unjudging setting can we endure such contact, without “forcing” ourselves. I consider it not a great idea to ever ignore emotional signals and force ourselves to do something. The signals exist for a reason. (I know no one was suggesting that). But this emphasizes the nature of our ultimate encounter with Christ (“without shame or fear”). We not only behold Him face-to-face, but, in so doing behold ourselves, and that we can bear it signals our complete healing. 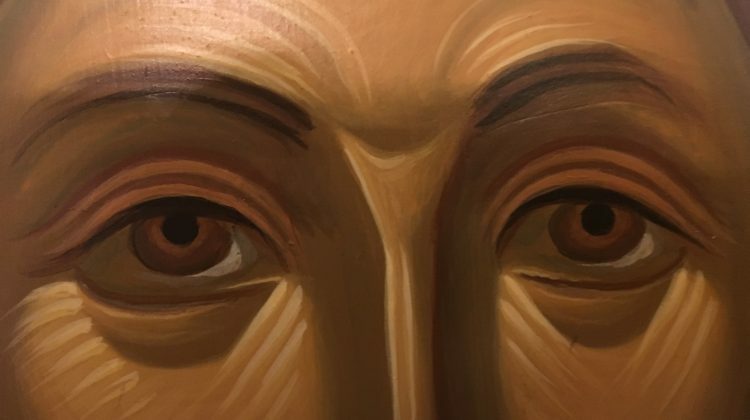 We move towards that ultimate goal, St. Paul says, “from glory to glory.” Every time we are able to gaze at Him (and be seen as well), such as in confession, we encounter that glory and transformation. If we understood this, we would run to Him! Thank you for your latest comment, Father. It brings to mind a struggle I’ve been having with my spouse recently. To oversimplify: we are both regularly attending divine liturgy, and I am taking classes in preparation to become a catechumen. Due to scheduling conflicts we can’t both attend the same classes. Lately, it seems to me she’s been having second thoughts and recently decided to wait a few months before starting classes. It frustrated me because I’d like us to both be on the same page, but we just aren’t. William, patience and listening in this process is always the best approach. If possible, a couple should do this together. It should strengthen a marriage and not weaken or stress it – if at all possible. I’ve seen a family take as long as three years in order to do this together. May God give you grace! Agata….thanks for that thread you posted, your initiation and contribution to an excellent discussion. The final comment from the brother in Brazil was outstanding. This post is also outstanding. And painful. So much so that I have tried but can not find the right words to comment directly to it. The most I can say is I live the “hiding”, even in “[my] frequent tendency to confess [my] problems and opinions and questions to others” as Dino so aptly describes above. There is a great lack that results with this approach. So I have built the walls to protect, and justify it by saying ‘I am a loner’. It is no wonder that true comfort is only found in Christ. I don’t even have to speak, but just merely look at Him, face to Face. Father…you’re comment @ 10:15 am…thank you. I think you understand what I’m trying to say in my last comment. There is a point where the pain to too profound, so rather than face it, we run from it. It is a form of protection. So you say “We not only behold Him face-to-face, but, in so doing behold ourselves, and that we can bear it signals our complete healing.” That is exactly it. He is the safe place. Only one thing Father…you say it signals our complete healing. I do not know if I am even beginning to heal. The only thing I fall back on are your reminders that our lives are hidden in Christ. Some things are just not evident. Do you know what I mean? I well understand. The “complete healing” is that which awaits us when, at last, we see Him “without shame or fear.” In the meantime, we often take “peeks” and the little that we can bear. If we knew how steadfastly He gazes at us, with love, without condemnation, we would heal so much faster. May He give us grace! I relish the “peeks” and pray for the grace to know His loving steadfast gaze. The exercise that I described in the workshop did not include direct eye contact. The looking at the exercise partner “with head and with heart” was done with the person observed having their eyes closed – I think otherwise this would have been an unbearable experience, especially considering the the other person was practically a total stranger. This is an excellent resource for Orthodox families whether home-schooling or not. Our children are all grown. I’m out of the loop. But you could link with some real help with your question through this resource, I’m sure. Dean – I also love the Aaronic benediction. FWIW: It is thought to be the oldest benediction in the Bible. Truly amazing how the wording has remained the same for at least 2800 years. Dean, that benediction is one of my wife’s favorites. It was often said at the end of the service in the church in which she grew up. I did not grow up in churches where a benediction was a regular part of the service. When we married and I began attending her church, I grew to appreciate the benediction, especially this one. But it’s not only that. Reading wisdom is eating. I get full and I have to stop. Or sometimes I over eat and I have to stop. Mary’s pondering is a wonderful model for me. She held these things in her heart. It’s like giving it time to digest. Learning to know that part of the process of learning is the digestion step has been helpful these past couple of years. And it’s not as if it’s intentional on my part, it seems to naturally occur. I don’t really know it has happened until something comes out of my mouth that I did not know was in my heart but that I know springs from wisdom I have read. And I’m not really sure I understood this cycle God enables in me until just now…or at least I couldn’t articulate it. Thank you, everyone for who you are. Your comments show God’s work in all of you. I’m grateful to benefit from you through your words. Your faces are beautiful. Know exactly what you’re talking about, Jeff. Thanks for sharing. Jeff, so true about the long pondering. In a small group of women I am making my way slowly through CS Lewis’ Mere Christianity, which I had not read since college (nearly 4 decades ago now!). I am amazed convictions I thought I had worked out myself over the years (since they really weren’t taught in the Evangelical churches in which I spent most my adult years) and at least a couple of which propelled me eventually a little over a decade ago into the Orthodox Church, were sown by Lewis back then. I guess I shouldn’t be surprised—I basically “lived” in Narnia during most of my formative years, rereading the series many times after I received them as a Christmas gift when I was eight. I’m sure the convictions Lewis outlines in Mere Christianity were embedded deeply in his fiction as well. David, thanks for the affirmation. It’s nice to know that I’m not alone…that we’re not alone. Karen, looking back, I now know that C.S. Lewis blew my childhood mind with Narnia, and then my adolescent mind with the Space Trilogy. At the time, I was completely unaware that this cataclysmic evolution had been initiated. The theater of the mind, especially the child mind is so real. When I read those books and others like them (Tolkien comes to mind), I was there. The book was the wardrobe and I went through it, tasting the sea that splashed Eustace’s face as he boarded the Dawn Treader through the painting. as if I became that flavor. Because of Orthodoxy, my taste is being restored and my appetite is improving. Taste and see that the Lord is good. Blessed is he who takes refuge in Him. C. S. Lewis also sent me, unawares at the time, lurching toward Orthodoxy. I say lurching because it came only with jerks and coughs and sputters over a period of 25 years. But, like the turtle, the jalopy of my life finally made it across the finish line only to learn that another race lay before me. But in this one a great cloud of “spectators” is cheering me on, along with many dear friends on this blog. Jeff, the Trilogy and Tolkien, too—oh yeah! CS Lewis has long been hailed as a sort of Patron Saint of Evangelicals, though he was not an Evangelical. Though he was not a formal member of any Orthodox Church, I dare say he yet must hold a sort of honorary Sainthood for many Orthodox in the West familiar with his work. Thank you for your responses to my comments. I know they came late and that this is not a “current” post. I appreciate you taking the time to offer your thoughts. Yes, Karen, I should revisit his writings. Now that I have a lens being ground into the shape of Orthodoxy, it would be interesting to explore his theology for the corollaries that parallel the Orthodox way of being. A Grief Observed, and The Abolition of Man is probably my next book (after The Way of the Pilgrim). The paperback is $10.86 but many Amazon reviewers say the hardback is well worth the hefty (for me) $42.53 price tag. That is because many report reading favorite portions more than once, I once read Mere Christianity many years ago, but that is as far as I got with Lewis. Yes, David, that price does sound more than I usually pay as well. But like you said, the content would be well worth it. Ah yes, I’d forgotten to mention The Great Divorce, one of the watershed books of my life…a supurb allegory. To have them all in one volume would be quite nice. Lewis was buried with an Orthodox cross made of flowers. His brother Warren was so distraught he couldn’t attend the funeral, so all the mourners were friends (and Joy’s sons, I believe). Among his friends were a Russian couple, who brought the flower cross and laid it in the grave before it was filled with earth. 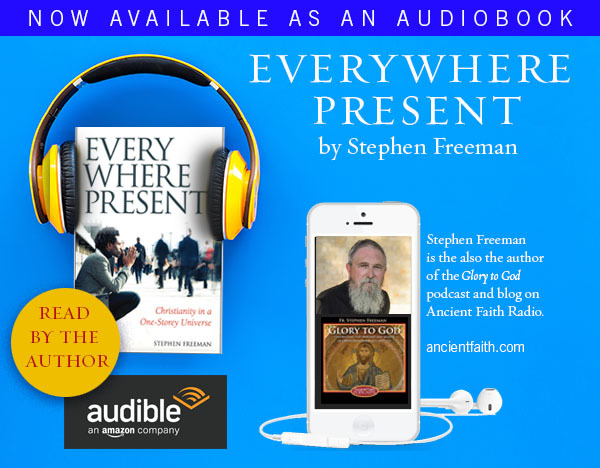 Jack and Joy took a trip to Greece, and he wrote that he enjoyed the Orthodox Liturgy very much, especially the fact that people moved around the nave and it was no big deal – he seemed to get a kick out of that. Thanks for that bit of history on Lewis. As one who cannot sit long without moving a little, I appreciate the fluidity in Orthodox worship. It was very evident today. Yesterday a new chapel at the monastery was consecrated. Part of that multitude remained for today’s liturgy. As the chapel accommodates perhaps 70, it was a bee-hive of movement as the 150 present continued shifting positions as the service progressed…almost a non-choreographed “dance.” The lighting of candles, adoration of icons, crossing, singing, bowing…not indecorous at all…a holy offering of bodies and souls in worship to our great king. CS Lewis, after meeting some Orthodox priests and monks towards the last days of his ( during his trips to Greece and especially Rhodes after spending Holy week and Pascha there in 1960) exclaimed that he believed these to be the most holy ones he had ever encountered . There’s perhaps some Chinese whispers going on as I heard it from someone in Greece quoting Met. Kalistos Ware. That’s too British for us. Agata – Help me out, please. How do you say that in Appalachian? C.S. Lewis comment on the faces of Orthodox priests reminded me that I was attracted to the Orthodox Church because of the faces of the priests I encountered. The vast majority of Othodox priests faces were relaxed and happy. Not true for the vast majority of RC priests and Protestant clergy. Now there was one RC priest I met in Fargo ND in the middle ’70s. He had a face of holiness. He has been a priest for 50 years. I found two other versions I like: Russian scandal and téléphone arabe. (for the Appalachian translation, we must wait for Father Stephen, I am afraid. I don’t even know it in my native Polish – but we are close to covering all major languages, aren’t we? Thanks Dino!). Agata: I am Polish too, and now I only know a few words but growing up my mother & grandmother spoke Polish all the time. I like the two other versions you mentioned, especially Russian scandal. I wish I knew what it’s called in Polish. “I don’t think your cornbread is done in the middle”….. I LOVE it!! Thank you Father, I will use this one with joy! And the frogs in Greece speak classic Greek. Agata: Thank you so much, that website is fabulous!!! My Grandparents were Polish, and my Chicago-born Mother went to Polish school on Saturdays, but I only learned food names. Yum!! But after reading this page on sounds, and spelling, I think they all need to buy some vowels! Growing up, our next door neighbors were Polish. We were closer than blood relatives… still are to this day. We had some good times! Shared all the ups and downs. Before moving to NY they worked the coal mines in Pennsylvania. Worked hard and played hard! They could play that accordion and guitar…and if a washboard was nearby, that too! Spoons…yep! Such memories! Back then it was proper to speak English, even if “broken”, so us kids picked up on slang mostly. I wish I could remember some of the Polish…too long ago. Returning to Dino’s original point, it has been said in Eastern Kentucky that if you cough in church everybody in town will know you are dying from consumption before you get home. There are some less socially acceptable variations on that theme that I will not discuss here. 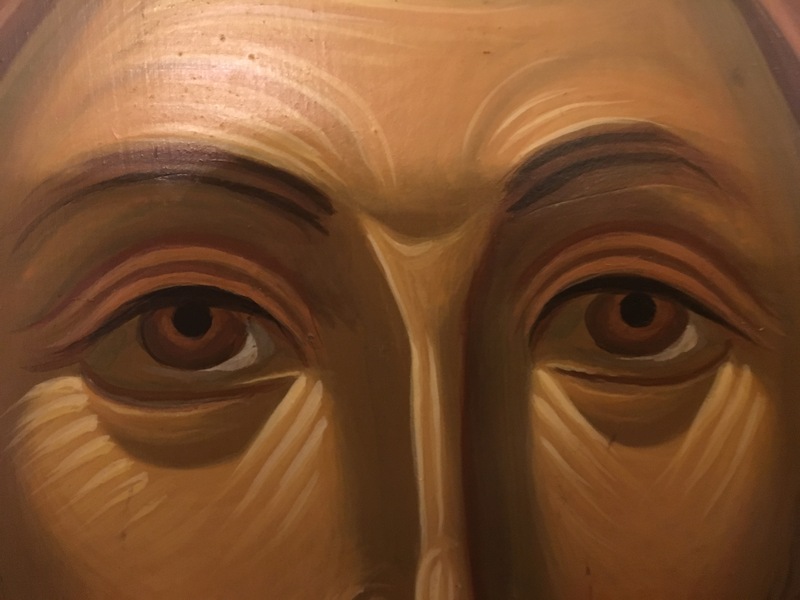 Is it too much to say that the face of Christ reveals our own face to us? I cannot say that for myself, Michael. I see Jesus, the god-man. I do not see me. Michael, I think that is the point of the verses. The truth of who we are–the mystery of our innermost self–is revealed in our reflection born in the face of Christ.